My name is Sarah, and I am a scientist in Mike Stratton’s group working on the Mutographs project. I have been working on this project for just over a year now, and as you will have read in the previous blog post, it has been a very busy year! I work mainly on work area 1 – analysing the data from 5000 patients with 5 different cancer types from across the world. We are trying to identify why these cancers are more or less common in particular regions by comparing the patterns of DNA damage (what we call mutational signatures) which can be caused by lifestyle and environmental factors. We hope that that we can identify new preventable causes of cancer by understanding the differences in these patterns. It’s a big task, but we have built an amazing team and it is a pleasure to work together with them to face this grand challenge! Here, I will share with you what we have already been up to in 2019 so far. The Mutographs project is one of 7 international Cancer Research UK Grand Challenge teams, which work on some of the biggest issues in cancer. Each year in January, all the Grand Challenge teams come together to share their progress and lessons learned, as well as exploring further ways in which we can work together to make progress in cancer research. This year, I was invited to give an update on our progress alongside Ghislaine Scelo from the IARC team. Together we shared some of the initial findings of the Mutographs project. 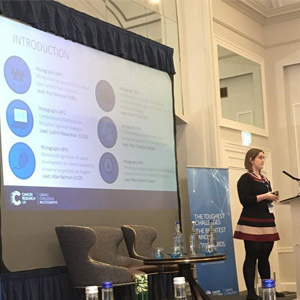 I love to talk about science, but this was quite the challenge, as the audience was very varied – alongside other scientists there were staff from Cancer Research UK and patient advocates. This was a valuable experience, as communicating science in a way that is accessible to all can be a tricky skill to master! It was also great to hear about the progress of the other Grand Challenge teams. As well as the established teams we also heard from three brand new funded teams, and we are looking forward to working with some of these teams in the future. Overall it was a busy three days, but an excellent opportunity to discuss the Mutographs project and connect with colleagues both old and new. One of the great things about the Grand Challenge projects is the way that they bring together researchers from across the world. However, this approach also brings challenges, as it can be difficult to communicate well as everyone is spread out over several continents and there’s a considerable time difference! 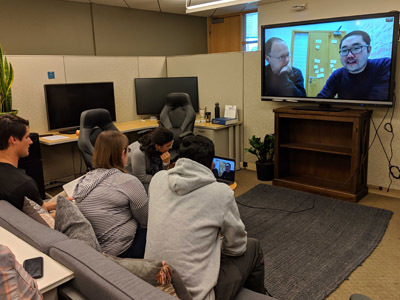 Thus, at the end of January a group of researchers including myself, Tim, Laura and Sergey from the Sanger and IARC based teams travelled to San Diego to spend a week with Ludmil Alexandrov’s team. This team are developing the programmes that we will all be using in the future to analyse Mutographs data. The week began with a series of talks from members of both the visiting and hosting teams, where we discussed early results from the project in detail, as well as coming up with new directions and strategies for taking the project forwards. In the final two days we spent time in smaller groups, with our hosts providing demonstrations of the various computer programmes they have created, and us attempting to run them in turn (with varying levels of success!). The opportunity to troubleshoot in person was extremely helpful, and by the end of the week we had all made good progress. 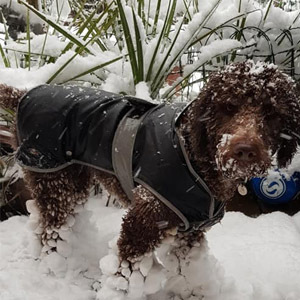 After a busy couple of weeks travelling I am now back in the UK (apparently I missed the snow while in California, but my parents’ dog Bernie seemed to enjoy it! ), I am currently hard at work getting more samples ready for our next data release in March. Since all Mutographs samples have their DNA sequenced at the Sanger Institute, we release data to the wider team every three months on what we call “Trains”. This release will include data from two new regions where oesophageal squamous cell carcinoma is very common (China and Japan). We are looking forward to seeing what new insights we can gain from these locations. I really enjoy working on the Mutographs project, and an important part of that is the opportunity to share what we do with the public. After the success of European Researchers’ Night the team are also planning to showcase the Mutographs project at the Cambridge Science Festival in March. If you’re in Cambridge (in the UK), come along to the Guildhall on 17th March to try out our ‘Cancer Detectives’ activity. You can also come and chat with the team in more detail about the Mutographs project over a cup of coffee at our free evening event at the Michaelhouse Café on 12th March – follow this link to book your place! I hope you found this blog interesting, and perhaps I will see you in March!